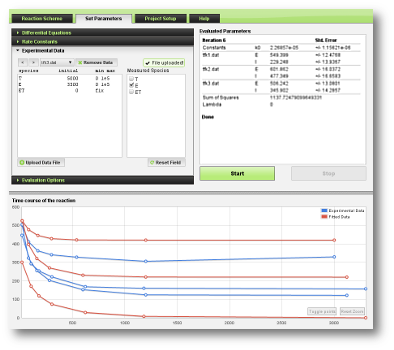 ENZO is a web tool for easy construction and quick testing of kinetic models of enzyme catalyzed reactions. The tool can be utilized by any interested researcher for efficient testing and evaluation of various kinetic models for a given enzyme catalyzed reaction. No installation or registration is required. It works on any operating system with a modern web browser. Test kinetic models in just 3 steps. ENZO has a graphical user interface for drawing kinetic reaction schemes. You can easily draw complex reaction schemes. 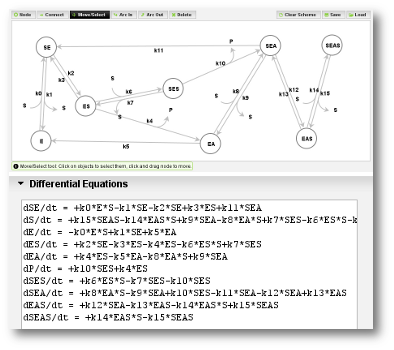 Differential equations are automatically generated from the constructed scheme. 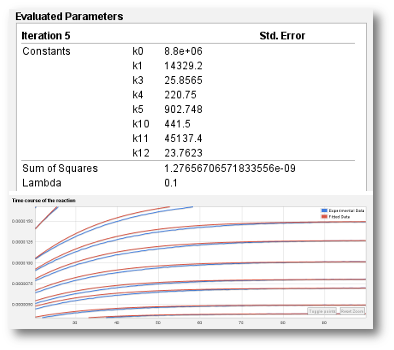 Enter initial, minium and maximum values of rate constants. Values can also be fixed. 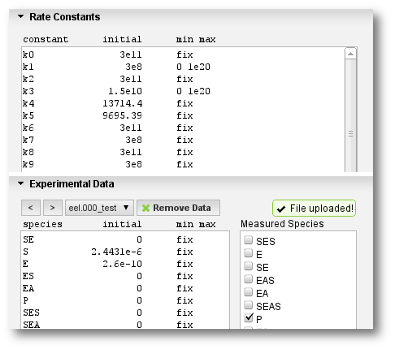 Upload your measured kinetic data. Enter initial, minium and maximum concentrations of species. Values can also be fixed. Data is shown on chart as it is uploaded. It is possible to upload multiple files at once. The parameters of the proposed kinetic model are fitted to measured kinetic data by a numerical solver. To see the progress of the evaluation, curve fitting is shown in real-time on a chart. This allows for quick evaluation of the proposed reaction scheme. ENZO runs on a high performance computer cluster, so multiple curves can be fitted in seconds.